Use local collard greens to give your next pasta salad a pop of color. Bring a large pot of water to boil. Meanwhile, roughly chop the collard greens into large pieces. Once boiling, season the water generously with salt, then add the collards to the pot, and simmer briefly, until bright green (approximately 1 minute). Using a slotted spoon, remove greens and dry thoroughly. Bring the pot of water back to a boil, then cook the pasta to al dente (per the package instructions). During the last minute of cooking, add the frozen peas to the pot. Drain the pasta and peas thoroughly. Transfer to a large bowl. In a food processor, combine collards and all remaining pesto ingredients except olive oil. Pulse several times, then with the food processor running, drizzle in the olive oil and puree until smooth. 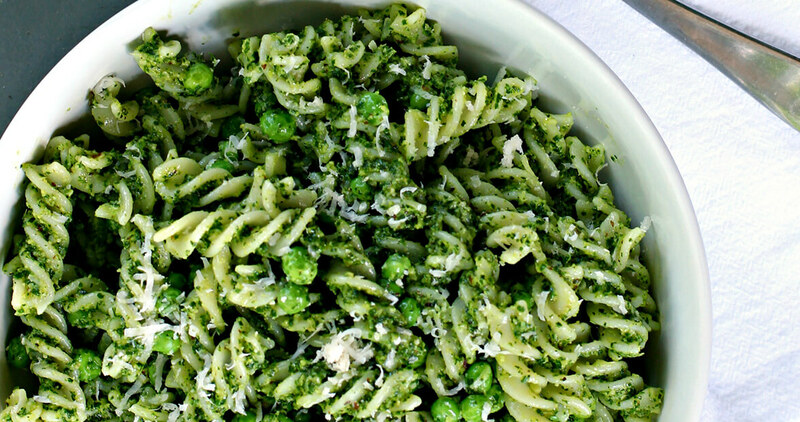 Combine the pesto with pasta and peas, then refrigerate, if desired. Just before serving, drizzle the pasta with additional olive oil and grated Parmesan cheese. Cowx is a food blogger from Charlotte. She loves bread, potatoes in every fashion, and ice cream, but she isn't afraid to write a diatribe against frozen yogurt.